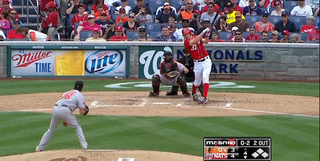 Stephen Strasburg went yard this afternoon in the bottom of the fourth against the Baltimore Orioles. It came directly after Jesus Flores hit a home run making it back-to-back (and a belly-to-belly, some might say) home runs. It was Strasburg's first career home run. He finished the game with eight strikeouts and gave up four hits through five innings. The Nats would go on to win 9-3.